We continue with our presentation of the wonderful recollections of Mr. Chidambaram Krishnan, a long-time devotee of Bhagavan Baba who came to the Lord under somewhat unusual circumstances. In the last instalment, we broke off at the point where Mr. Krishnan digressed to tell us a remarkable story about how in the middle of nowhere, Swami filled the empty petrol tank of His car just by tapping it, even as He had earlier produced snacks and coffee in Quilon beach with Divine taps. In this the fourth instalment, Mr. Krishnan describes how he came to Puttaparthi to discuss with Swami the arrangements for his marriage and what happened subsequently. Read on. As I was telling you earlier, in Trivandrum, Swami had assured me that He would protect me from death, and I had lost all fear on that account. He then began to talk about my marriage. He asked me, “Who all would form the marriage party and how many would attend?” I replied, “Swami, first the date has to be fixed and it only after that one can consider and discuss all these details.” To this Swami said, “Alright, you go home now and then come straight to Puttaparthi; we can discuss all the details there.” I agreed and left for my hometown. The date was 14th March, 1960 , and I was still alive! Swami spent two more days in Kerala and then left for Puttaparthi via Cochin and Bangalore. One problem we faced on the way was that there was a lot of hostility to Swami in the villages surrounding Puttaparthi. In those days, we did not have the by-pass road that goes past the airport. One had then to go via the road that passes through Brahmanapalli village. The residents of that village had placed a huge stone in the middle of the country road, claiming it was their deity. Actually, their real intention was to block traffic to Puttaparthi. They would not even heed to the appeals of Swami to remove that stone. If anyone tried to have that boulder removed, the person would be attacked. It was nightmare to negotiate past that boulder in the car. 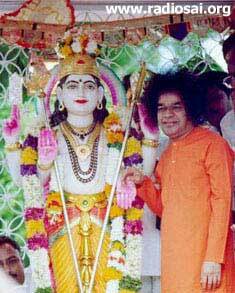 When Swami asked us, “Was it very difficult coming here?” – remember, I was coming to Puttaparthi for the first time - we replied, “Swami why fear when You are there?” Having said that, I must repeat that my experience with Swami at that time was very limited. I had seen Him in Surandai, and spent a few days with Him in Kerala – that was all. Swami then changed the topic to my marriage. He asked, “Are all plans ready? How many of you will be coming?” I replied, “Swami, about three hundred to three hundred and fifty people.” Swami said very happy to hear that and then asked whether the Mangal Sutram (Sacred Necklace) had been made. I replied yes. Swami then said, “You can have your Mangal Sutram but I shall create one for the bride Myself. She can wear two instead of one.” With a smile, Swami then added, “That would be extra protection!” He then ended the meeting saying, “I shall speak about other things tomorrow.” Next morning, Swami summoned Suraiya, who in those days used to be in charge of cooking arrangements for visitors. Puttaparthi being very backward, practically nothing was available here and all major shopping for groceries had to be done in Hindupur. You would not believe how different things were then. Swami would grant interviews around Bhajan time. There would be very few people around, may be about five or six only! Of these, about two would be called in for the Interview and the others would be left out. Inside the Interview room, He would talk to each person for about forty five minutes or so. He would not wait for your question and would plunge into a narration of the entire life history of the person He is talking to! And He would answer all the questions one has, without waiting for the person to ask! In those days, there was no need to ask any questions; He would anticipate them all and have the answers ready! Those were indeed wonderful days! I was totally confused by what I was hearing. Here was Swami giving specific instructions that food must be planned for 1500 whereas this man who is supposed to arrange all this is saying he would plan only for 350 or so! I just left it at that. 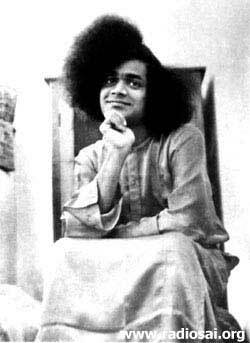 In those days, Swami used to come down from His room upstairs in the Mandir around 4.30 in the evening. There used to be a Brahmin scholar named Brahmam. He was the only priest in the Mandir in those days. This Brahmam would be seated in the front in the Bhajan Hall with a small desk in front of him, like the one clerks used in those days for writing accounts while squatting on the floor. 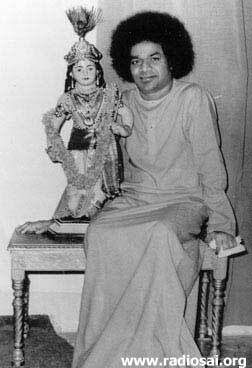 When Swami came down, He would not sit on the chair placed there for Him. Instead, he would sit on the raised platform below the chair, on which was spread the tiger skin. In all, there would be about 7 or 8 people only. There were of course about twenty and odd ladies in the Ashram but they would not attend this evening session with Swami. You see, in those days, very few people really knew that Swami was God in human form. They felt that He was a holy man with some special powers – that is all. Many came to see Him but worship of Him was still taboo. 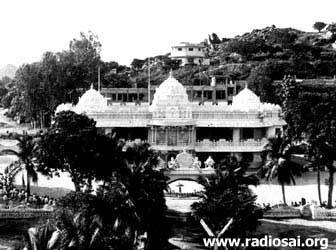 For example, in those days, Swami used to stay in the West Wing of the Mandir and would walk along the veranda in the first floor towards a room in the East Wing for His meals. People would gather below and watch Him walk across. But if anybody joined his palms as a gesture of worship, that person would be ridiculed. And Swami also contributed to the process by throwing the veil of Maya. He moved with people like a friend. Nobody had heard of God moving around like a friend and that often made people to overlook His Divinity. He just did not disclose His Divinity to all. He would casually call someone, take that person to the Interview room and spend time chatting with that person! Turning to my relative who had come with me I said, “Look, I am not happy with what’s happening here. Firstly, it is a grave mistake for a man to declare that He is God. 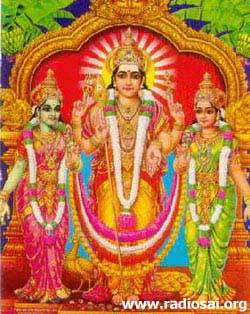 Secondly, He asserts that He is Rama, whereas you and I worship Lord Muruga. I think this is not the place for us. Let’s go back!” He did not agree and I fell silent. After that there were Bhajans and Swami went upstairs, taking me along with Him. Once again He started talking about my marriage, and told me that He would give more instructions on the following morning. In the evening, there was one more session that started off with Mr. Brahmam reading out some passages from the Mahabharatha and trying to explain the meaning. Swami intervened like on the previous day, and said many things not found in the usual texts. At this point, I gently tapped my companion and whispered, “Listen, I am not at all happy with what’s going on. First He says He is Rama and then He says He is Krishna. Whatever it is, He certainly is not my Lord Murugan. I think I had better get back home.” My companion replied, “Hold on! Just be patient and wait for a while. We can discuss all this calmly later.” After this there were Bhajans and Swami then retired upstairs. I then left home and went straight to Tiruchendur to worship Lord Murugan there. Standing in front of the idol I said, “O Lord! I was disloyal to You and went after a man who says He is God. Please forgive my temporary betrayal.” I then had elaborate rituals performed in grand style, by way of atoning for what I believed was the sin I had committed. After all those rituals had been performed, I felt somewhat calmer inside and then returned to my home. I must interrupt to tell you that till then, I had not really experienced in depth and in full measure, the Love and Compassion of Swami. True, He had lifted my spirits, and true He had enabled me to live beyond 14 th March 1960. But my eyes were yet to be opened. And that happened almost immediately after I returned from Tiruchendur. Meanwhile, Lord Muruga disappeared, and His place there now appeared an old man whom I could then not recognise; I now know that old person to be none other than Shirdi Baba. Once again I protest, asserting loudly that I was not mad by any means. While this was going on, the old man fades away and in His place I see Swami. So first there was Lord Murugan with Valli and Deivayanai, then Shirdi Sai in place of Lord Murugan, and now our Swami with the two consorts of Murugan on either side; and they all were laughing. Once again I was described as mad and once again I registered my protest. Just then I woke up with a jolt and I realised it was all a dream. I then began to reflect asking myself, “What does all this mean? Did I have the dream because I was thinking intensely about all these matters or was it that Swami deliberately made me have this dream?” I was wondering how to sort this out. 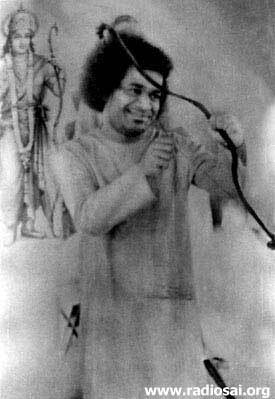 I then came to a decision: “This very minute, I shall leave for Puttaparthi. If on His own Swami makes a reference to this dream, then it means it was no accident but set up by Swami Himself; and it also means that Swami IS God. On the other hand, if Swami does not refer to this dream but instead scolds me for leaving without informing Him, then it means that He is only a man. So what happened after that? Did Mr. Krishnan go to Parthi or did he not? To find that out, watch out for the next instalment!